So, before the Foos gig in Milton Keynes yesterday, I had me a mini fashion crisis. I have been DYING to wear my (sold out) H&M maxi dress because it is all kinds of fabulous and it (kind of) goes with my green, fest-friendly Converse trainers. 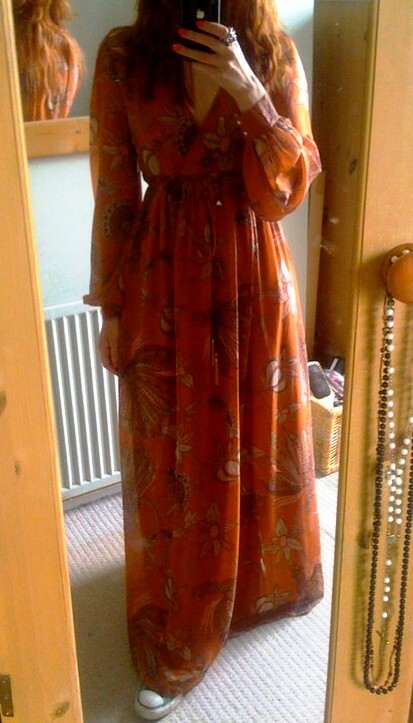 I had visions of myself sashaying around the festival site like a vision in 70s-inspired, Earthy orangeness. I got as far as choosing my accessories and then had a crisis of confidence: Would I look like a woman in a ballgown, in a sea of women in denim cut-offs and black rock tees? Well, yes, probably – but that has never stopped me before. I decided to do an emergency Twitter poll which raised the very valid questions, a) would I be too warm? 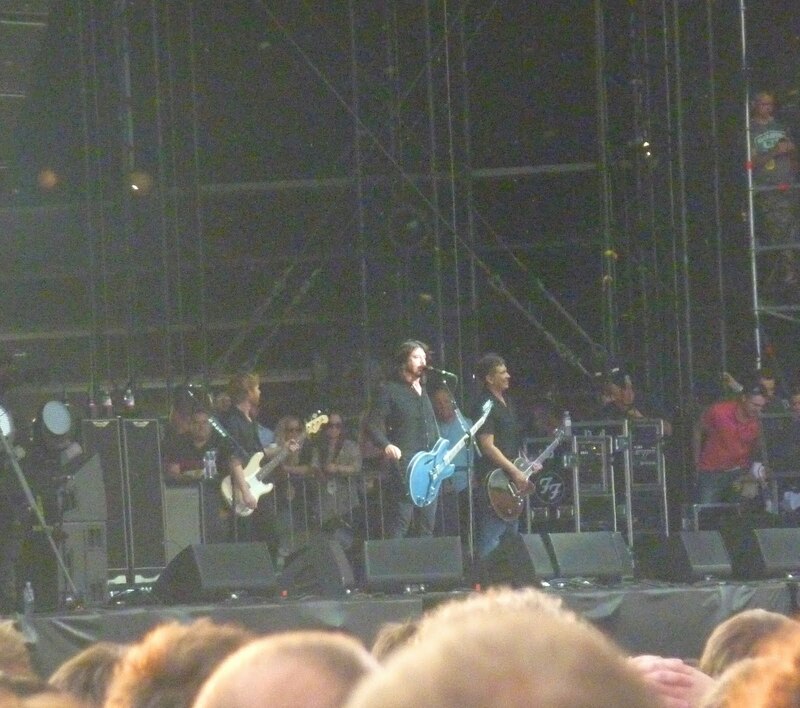 b) was it too posh for a mucky field crammed with 65,000 sweaty rock fans? and c) would the dress make it impossible for me to clamber onboard a tall man’s broad shoulders and flash my boobies at Dave Grohl if I had that urge (wouldn’t be the first time)? In the Universe I inhabit, this was oodles more practical – whilst still being slightly unsuitable for head-banging and leaping around like a child. 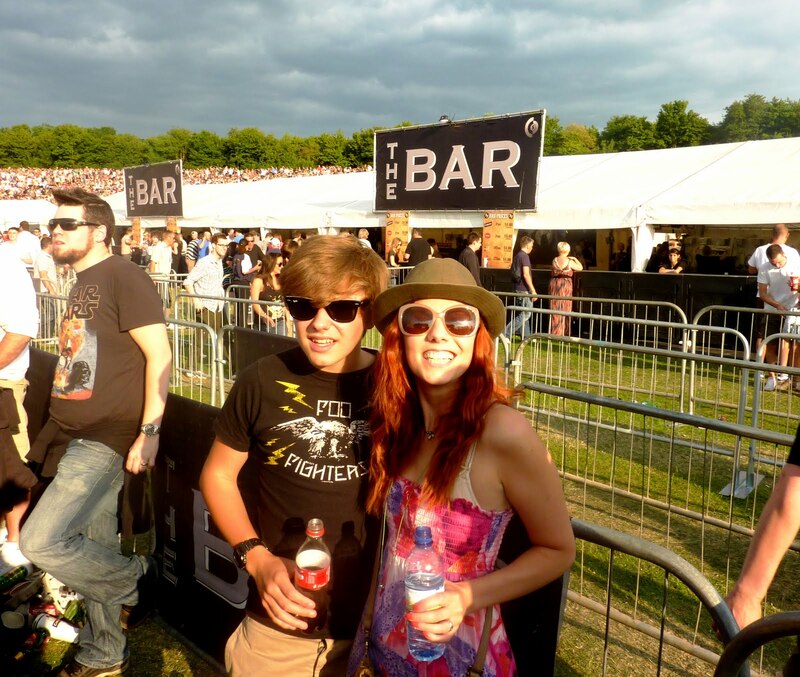 And I chose wisely – it was so hot, I had to ditch the tee before I even got to the gig. Shame I didn’t bother to wear a strapless bra (that’s what believing the British weather forecast will do for ya). And the bottom of the dress ended up caked in mud and dubious Port-a-loo ‘liquids’ (not from MY bodily functions I hasten to add – and don’t worry, it is being boil washed as I type). 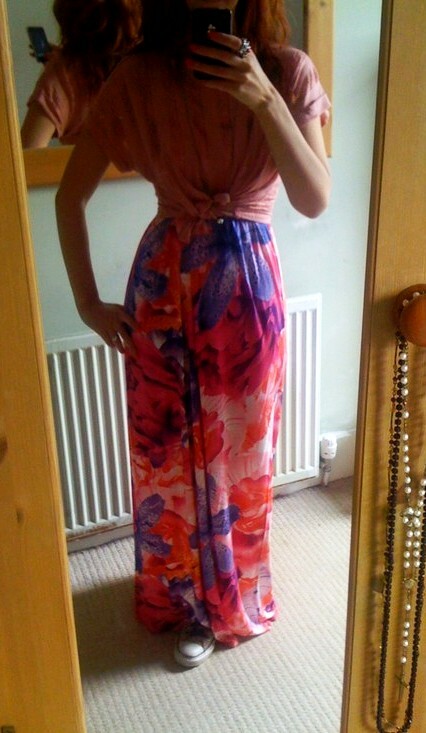 My H&M maxi is far too precious for that dirty gubbins. Anyway, here I am in all my ‘bra on display’ glory (it looked better after a fresh “ooch”) with my 14-year-old rock husband (long story). Don’t let that bottle of water fool you, either: This photo is sponsored by sheer pre-Grohl excitement. And Bacardi Breezer. 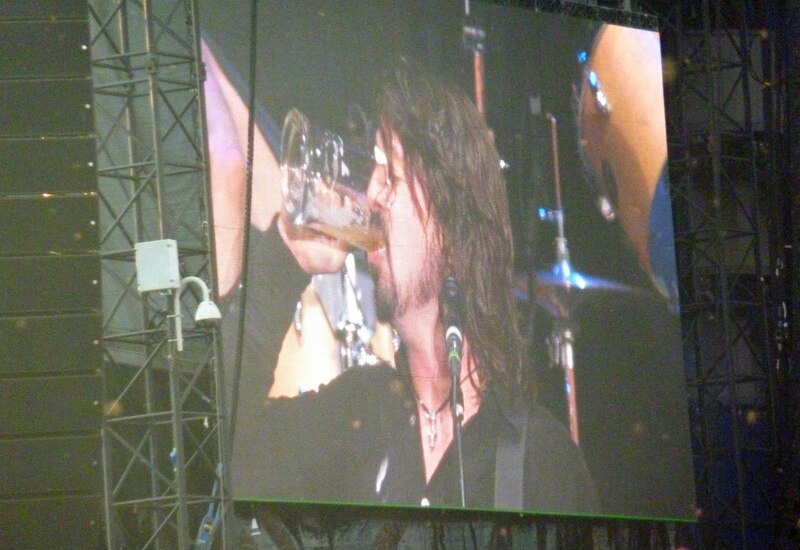 Dave considers downing a pint. Dave backs it in one. 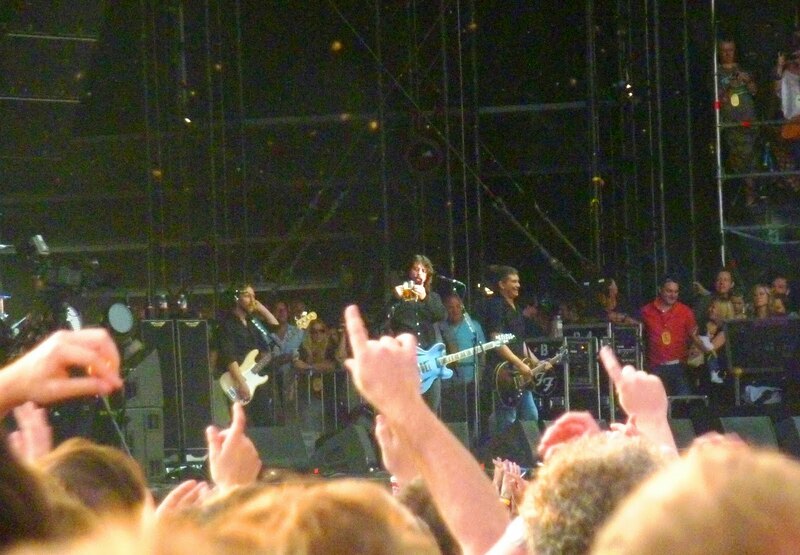 (And, PS, just so as you know, the Foos were better than they have ever been – Dave’s solo rendition of Wheels was a particular highlight; Alice Cooper was wheeled out to sing School’s Out during the encore; and I drunkenly regaled everyone, on the loooong walk back to the car park, with my infamous tale of running away from Mr. Grohl, on the one occasion I had the chance of meeting him, in the lobby of the St. Martin’s Lane Hotel. Celebrity Big Brother 2013 – is there any style?